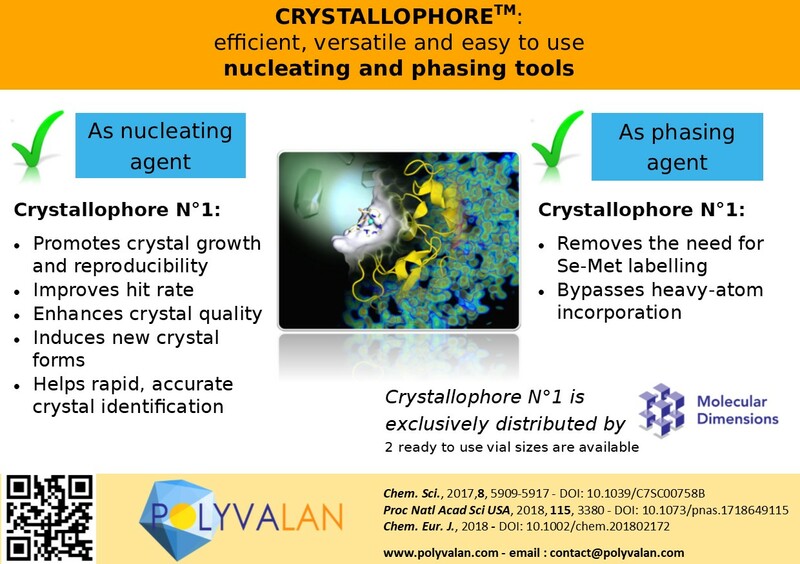 POLYVALAN CRYSTALLOPHORE products are efficient, versatile and easy to use nucleating and phasing agents for X-ray crystallography. Learn more now! Commissariat à l’Energie Atomique et aux Energies Alternatives (CEA). The patent application is covering both Tb-Xo4 products family and their applications in structural biology. Polyvalan first product is a unique patented tool for protein crystallography that can solve three problems at once : forming, finding and phasing. Crystallophore n°1 is a luminescent Terbium complex that is an effective nucleant and provides significant isomorphous and anomalous phasing power. What is the usual final concentration of Tb-Xo4 in the protein solution ? Tb-Xo4 should be dissolved by mixing it with 100μl of protein solution to reach a final Tb-Xo4 concentration of 10 mM. Then the crystallization experiments should be set up by mixing a volume of this « protein + Tb-Xo4 solution » with an equal volume of precipitant solution. What is the range of final concentrations of Tb-Xo4 in the sample ? The proposed 10 mg/ml concentration is the optimal one. When hit is obtained, it’s possible to conduct an optimization by playing with the protein solution volume used in order to vary the Tb-Xo4 concentration from 2.5 to 15 mM. 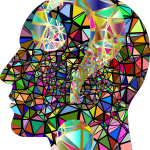 Are there any problems using additives such as EDTA or EGTA ? There should be some competition with EDTA or EGTA to chelate the Terbium but we don’t know what will be the cinetic for a potential Terbium decorporation that could affect Tb-Xo4 efficiency. If EDTA or EGTA concentration is low (< 2 mM), this could only affect up to 20% of our Tb-Xo4 complex : the unaffected 8 mM Tb-Xo4 are then still falling inside its efficiency range. Is there any limitation on pH or buffer composition or possible ligands in co crystallization ? Tb-Xo4 has been designed in order to be stable and highly soluble in aqueous medium and consequently fully compatible with high throughput screening. It is stable in all crystallisation conditions that have been tested ; please note that in some cases the presence of phosphate can be detrimental to the efficiency of Tb-Xo4. 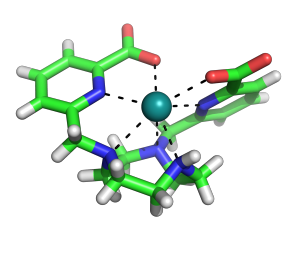 What are the preferred binding sites or amino acids for Tb-Xo4 ? There is direct interaction between protein negatively charged residues but not only. Are some groups of enzymes inhibited by Tb-Xo4 ? It has never been observed but we cannot exclude it for very specific proteins.